Whatever room you are thinking of decorating, you should consider the size of the room and how it is used in order to help you create the best looking and the most beneficial room design. If you are attempting to decorate or redecorate a room that is limited in terms of the space that it offers then this can prove especially difficult but there are some tips and guidelines you can follow in order to ensure that you make the most of the limited space you have. Storage is important in any room. You should provide some storage in limited spaces but don’t get carried away. Cupboards that are built into the alcoves can proffer all the storage room you need without overpowering the room. Everything in the house should have its place and if you only have a small living room you should make sure that junk is kept to a minimum and items live where they belong. Displaying photos and ornaments is possible in a small living room but you will need to show some restraint. Displaying too many pictures will become overbearing and people in the room will feel overwhelmed, almost as though the photos are bearing down on them and watching their every move. Keep ornament placement to a minimum as well and reserve space for useful rather than decorative items. Opt for a flat screen TV and have it mounted on the wall. This greatly reduces the amount of space and the size of the footprint that is required for its storage and you can even buy one with both satellite TV and a DVD or Blu Ray player built into it. Buying an all in one device like this again means that you do not need to allow as much room. Dark colours will make the room feel even smaller so stick to light and neutral tones. Natural light and the intelligent use of mirrors can help to give the room the appearance of being much larger than it actually is. Try placing a mirror directly opposite the entrance to the door; this will give the illusion of space even though it doesn’t really exist. 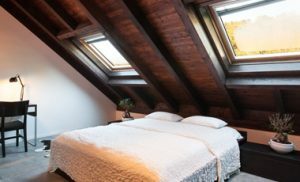 If you are redesigning, then getting as much light as possible into a small room is vital to make it feel larger – take a look at this double glazing guide to see if yours are up to scratch?